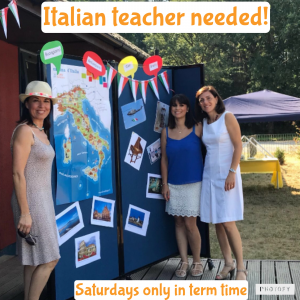 Excellent opportunity to teach in an Italian Academy in Woking. Experience not essential – we are looking for enthusiasm and the right attitude more than anything! The teacher will be working for the Accademia on a freelance basis. The teacher will have a range of books and materials and deploy audio-visual resources to encourage students to communicate using structure and vocabulary. A strong emphasis is placed on dialogue, role playing and TPR, but also language games and culture references are also used. * Plan, prepare and deliver lessons to children – training and support will be provided. * Attend regular meetings and support other members of the Accademia as we grow this wonderful brand.